What’s the difference between Use By and Best Before dates? Have you ever gone to the fridge to cook something and noticed at the last second that the date on it had passed maybe a day or two ago? Did you chuck it out and cook something else, or did you chance your luck and give it a go? Depending on the particular type of label on the food, it may or may not have been OK. There are big differences in the meaning of the various dates on UK food packaging. Some dates are absolute drop-dead dates, or rather drop-dead if you eat it dates, where others are more advisory. It can be a slightly confusing business. The one to watch is the ‘Use By’ date. ‘Use By’ is an indication of food safety and is applied to foods that can and do go off with disastrously pathogenic consequences. These are foods that can spoil quickly and are very perishable from a microbiological point of view. They go off quickly, and when they go off, they can do you some real damage. ‘Best Before’ means something subtly different. A food with a ‘Best Before’ date will be in good condition up until that date, but after it, its quality will have degraded. It won’t necessarily present a risk of illness, but it won’t be as good. Those packets of spices you bought a couple of years ago for that obscure curry are probably a good example – they’ll probably be safe to eat, but they’ll taste of…dust. Something a couple of days past it’s ‘Use By’ date could be a real hazard, even though it might look and smell perfectly fine, but something a couple of days past its ‘Best Before’ date will most probably be fine. One is a dire warning, the other a bit of gentle advice, but people don’t often distinguish between the two, which results in tonnes of perfectly edible food ending up in the bin every day, just bear in mind that the old maxim of ‘if in doubt, chuck it out’ holds true. It’s a criminal offence under the Food Safety Act 1990 to sell food that’s passed its ‘Use By’ date, but it isn’t an offence to sell food that’s passed it’s ‘Best Before’ date. Except it might be, sometimes. The Food Safety Act requires retailers not to offer food that has deteriorated beyond an acceptable quality to the consumer. Now, that seems to me to be open to quite a lot of interpretation…it’s the consumer’s word against the retailer’s, and it helps to explain why near dated foods being sold off cheaply are always plastered in big stickers showing the reduction and drawing attention to the date. The retailer protects him or herself by making it very obvious that the goods are coming up to ‘below par’. 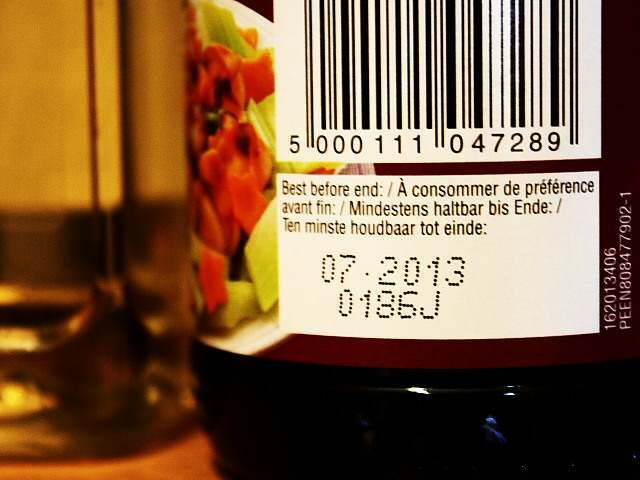 The other common label, as if food labelling wasn’t complicated enough, is the ‘Display Until’ date. This is normally used for stock control purposes, so that shops can pull produce from their shelves as it nears the end of its life. ‘Display Until’ helps shops to rotate stock properly and sell you the oldest stuff first, you lucky people. Not everything needs to be labelled, though. Some things are viewed as so indestructible that they don’t need a mere ‘Best Before’ date. These superfoods include things like drinks with more than 10% alcohol, salt, and vinegar. Do you see a pattern there? They’re all things that have naturally preservative qualities. That bottle of twenty year old gin is unlikely to cause you harm, but it probably won’t taste as good as a new bottle, although it’ll still make you drunk. All of this assumes that you, the buyer, store the food in the right way anyway, but that’s a whole different post. It’s clear that proper date labelling on food is important, especially given that the consequences of getting it wrong can be dire, fatal even. Why, then, is the system so unclear? Why are there three different dates in play at any one time? A good way to cut through it all is to ignore ‘Display Until’ entirely, follow ‘Use By’ to the letter and use your judgement on ‘Best Before’. There’s some good advice on the Food Standards Agency website on this. They’ve been campaigning to raise awareness about the difference between the different dating schemes, but really, they should be going further and be calling for a simplification of the rules. Thank you for some really good information! I’m one of those that if it’s at the date (either expiration or best before) I chuck it. I try to use it before then….but it doesn’t always work. I generally won’t eat anything past a use by date but there’s lots of stuff in my fridge past its best before. What a well explained post! I grew up in a household where the sell-by-date just meant ‘give it a smell’, so it’s never overly bothered me. I’m a big fan of the bright orange ‘reduced’ sticker, too. Ingredients don’t tend to hang around more than a couple of days so it doesn’t tend to make too much difference. I agree with you on simplification, though. I don’t think most people are even aware there’s a difference between the terms. They’re moving in the right direction, though, and have recently pledged to get rid of the (quite frankly ridiculous) sell-by-dates: (http://www.guardian.co.uk/environment/2011/sep/15/food-waste-sellby-dates). Can’t possibly fault your article re “Use By”. As consumers, we simply cannot always tell if something is no good to eat – salmonella and C. botulinum do not smell! Personally, I don’t have a microbiology lab in my kitchen, so I have to exercise caution and work to the manufacturers’ dates. I have a little grouse with some companies re the “Best Before”. Some of these are set VERY tightly – it’s almost as if they want you to find that your stuff in the ‘fridge is past the BB date so you’ll HAVE to get fresh stuff. Next thing is that someone will be telling you that stale bread is no use and should be chucked out.